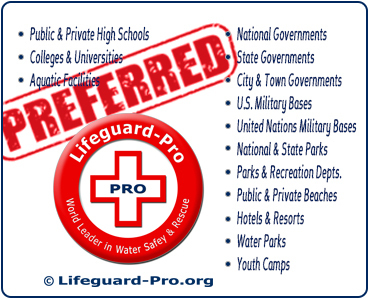 Lifeguard-Pro will send a Lifeguard Instructor, Water Safety Instructor (WSI) Trainer or CPR & First Aid Instructor to your facility anywhere in the country or around the globe to conduct Lifeguard certification courses, Water Safety Instructor (WSI) certification courses, and CPR & First Aid certification courses for your employees or group at your location on the dates you schedule. 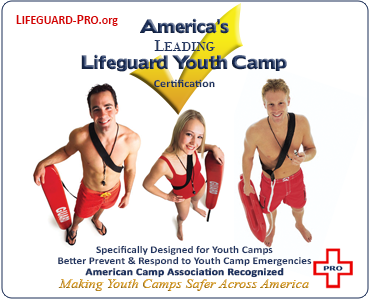 Lifeguard-Pro makes obtaining your Lifeguard, Water Safety Instructor, and CPR & First Aid certifications easy! Schedule a group training at your facility now! Personal Items. 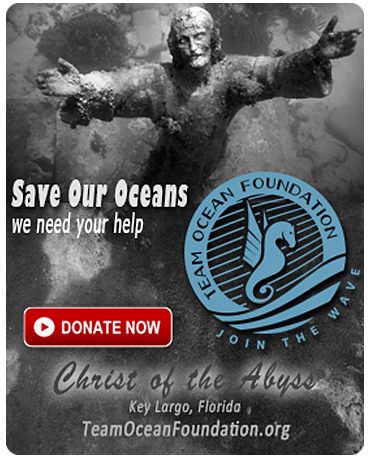 Bring bathing suit, towel, sunglasses, warm dry change of clothes, sunblock, lunch, snacks and plenty to drink. 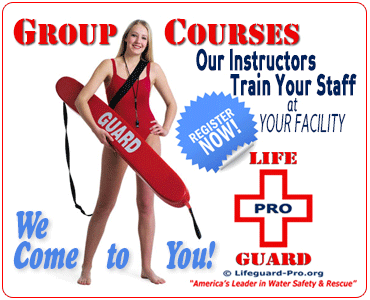 You may be outdoors for the full duration of your Lifeguard certification course or Water Safety Instructor class. Certification Paperwork. Print and bring to class your Certification Request Form. You and your Lifeguard Instructor or Water Safety Instructor Trainer will fill out and sign this form at the conclusion of your in-person training session. If you are under 18 years of age, your parent or legal guardian must sign this form for you. Then, login to your Lifeguard-Pro.org profile and uploard all pages of your completed and signed Certification Request Form. Make sure to follow the certification instructions on the Certification Request Form and within your Lifeguard-Pro Profile. 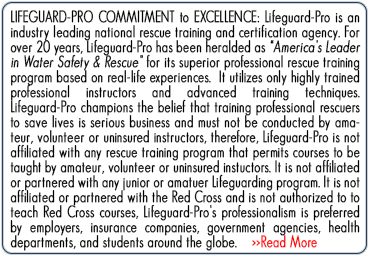 Otherwise, Lifeguard-Pro cannot issue a certification card to you. Payment. 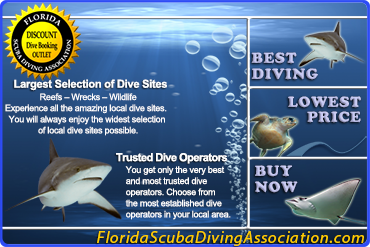 To ensure you receive a convenient training location and date, contact our friendly customer service team or your in-person training instructor. You are not required to pay for your in-person training session until you schedule a location and date that is agreeable to you. Once you schedule your in-person Lifeguard or Water Safety Instructor (WSI) training session with your authorized Lifeguard-Pro in-person training instructor, you must pay your in-person training instructor for your class. Without payment you cannot participate in an in-person training session. Reservation Required. To attend in-person training, you must have satisfactorily completed all of your certification course academic requirements, exams, and confirmed your reservation directly with your authorized Lifeguard-Pro in-person training instructor. Because space is limited, only students with confirmed reservations will be admitted to class. Bad Weather. Check weather forecast immediately before driving to class and bring appropriate clothing, including rain gear. Class will only be rescheduled if it is forecasted to storm for more than 4.0 hours during the scheduled classtime. Class will not be rescheduled for mere rain. Classes are rescheduled only for stormy weather. Address & Driving Directions.Contact instructor for address and directions, and confirm that GPS produces accurate results to your location. No Call - No Show Cancellation Fee. If you desire to cancel your scheduled in-person training session, you must notify your in-person training instructor via email 72 hours or more before your scheduled in-person training session. You are responsible to confirm that your in-person training instructor has received your cancellation notice. Therefore, it is advised that you also telephone your in-person training instructor to confirm that he/she received your cancellation notice 72 hours or more before your scheduled in-person training session. Failure to provide this common courtesy cancellation notice will result in a $50 in-person training cancellation fee that you will be required to pay directly to your in-person training instructor before Lifeguard-Pro will issue a certification to you. Evaluate Your Instructor. 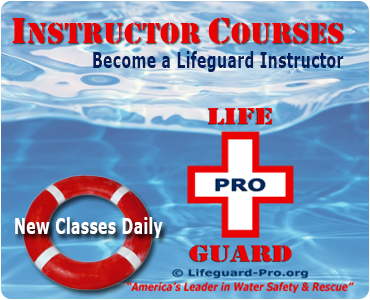 Lifeguard-Pro strives to provide you with a professional, effective, time-efficient, and courteous rescue training experience. At the conclusion of your in-person training session, you will be asked to provide us with feedback about your experience with your in-person training instructor. We value your comments. If you could not find a convenient in-person training class in your home state, check your neighboring states for classes offered. Sometimes classes in your neighboring states are nearby and even more convenient. The list above does not always include all classes in your area. New classes are being added frequently. If you still cannot find a convenient CPR, Water Safety Instructor (WSI), Swim Coach Safety Training or Lifeguard in-person training class in your area, call our friendly customer service team for assistance at 954-607-2282. We will find you the most convenient class for you!